A visit to the annual Pushkar fair (held during the month of November) had been much awaited from my end for years. 2013 was the year when the wait was over and I finally got an opportunity to join a group of photographers who were traveling there. Most people came back with multi-pronged images of camels and horses but my camera was captivated by the delightful culinary servings of the place which varied from traditional to international with amazing ease and some non-culinary ones of gorgeous Japanese women dressed to kill in rajasthani attire and of hot air balloons rising over sand dunes . . . . . . . . The first evening, we landed at a local roadside joint and ended up devouring tonnes of stuffed paranthas from potato to methi or fenugreek , the traditional daal baati choorma, pungent spicy garlic chutney and steaming mugs of aromatic ginger tea. 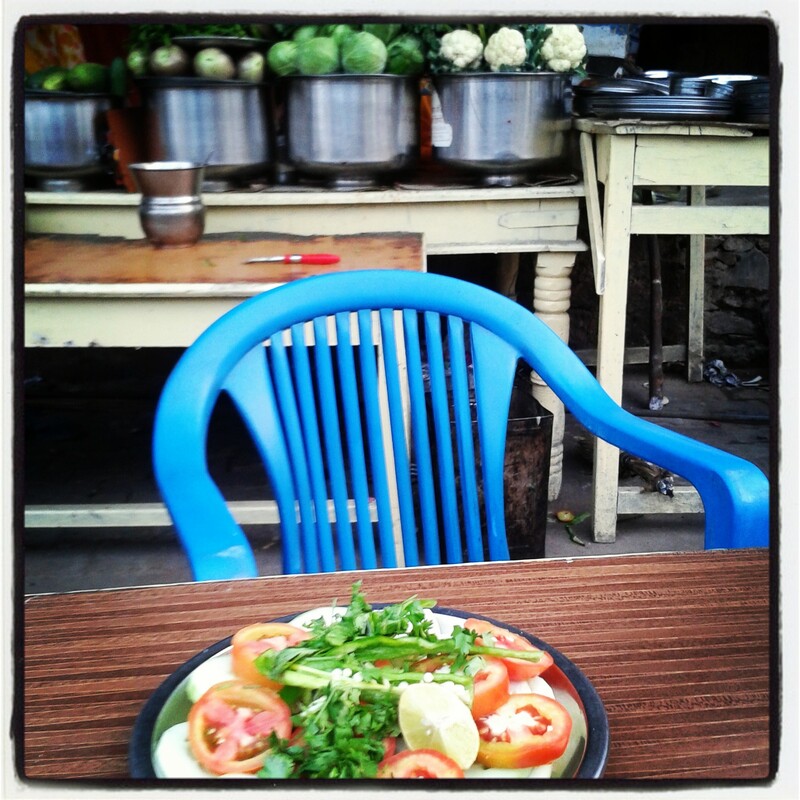 A large plate of fresh salad was served up first to whet our appetite but it ended up fuelling our hunger even more. 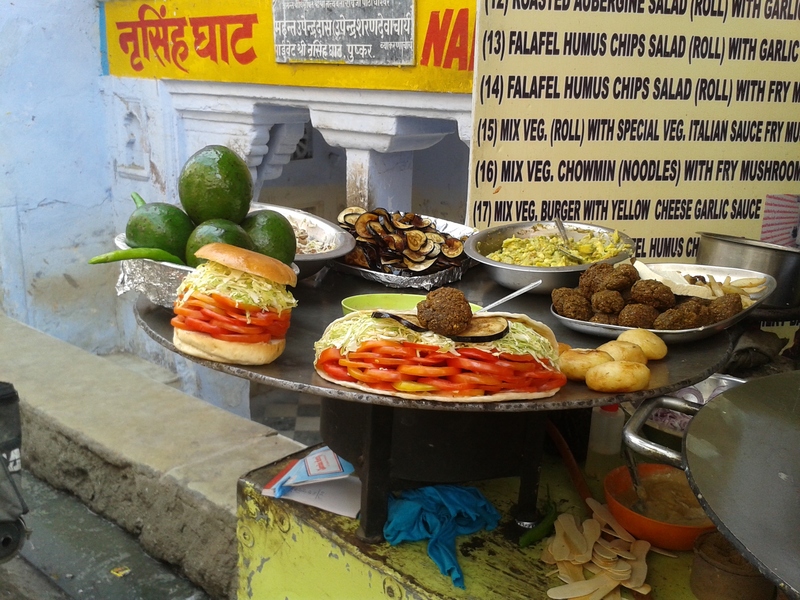 Our next food sampling was falafel rolls in the main street of Pushkar. The road side food stall was an unbelievable sight – avocado, mushrooms, egg plant chips, hummus, chopped veggie mix and some more exotic food stuff -all decked up on a giant round tawa.!! The cook was so adept at stuffing, rolling and cooking it on the hot girdle – all within a matter of minutes!!! The menu board behind him was as tall as him with more than two dozen variations of the roll. While biting into one, a famous tagline flashed through my head – ” no one can eat just one!” And indeed I had one more before leaving Pushkar to preserve the taste bud memory for eternity. I cant thank Gaurav for introducing me to this joint and catering to my cravings of just one more roll please. I re-lived a much loved childhood memory of eating when I chanced to see a huge pile of fresh green singhada or water chestnuts. I have never eaten such sweet juicy ones and gorged on them to my hearts content. Star fruit was the other childhood pleasures I indulged it. Biting into the juicy and tart fruit was an overwhelming hit of deja vu;any moment expected to hear my mom scolding us for eating such a sour fruit as it would give us a sore throat. A friend noticed my FB update on Pushkar and immediately messaged to say that I must visit his friend’s food joint there. Following the details, I set out to have a meal there on my last day in Pushkar. Cafe honey & spice is nestled in laxmi bazar and is an unpretentious place with a homely feel to it. Perusing the menu made me rethink the unpretentious bit!!! Mustard sprouts, shatoosh drink, amazing variety of cheese with the sandwiches; infact the combos of foods was just mind boggling. It seemed a mad food scientist had gone over board. I ordered a cool sounding lemon based drink which was simply yum. Thirst quenched, I moved onto another one which was soda based and this was delicious as well. I then ordered brown toast with cheese, olives, sundried tomatoes, rice crispies and salad – it was a wholesome. fulsome dish and left me gasping for air. But the tastebuds were singing Hakuna Matata with great abandon. Indeed a delicious experience and very humble and down-to-earth hosts. I managed to have a word with them to thank them for their wondrous food and hospitality. 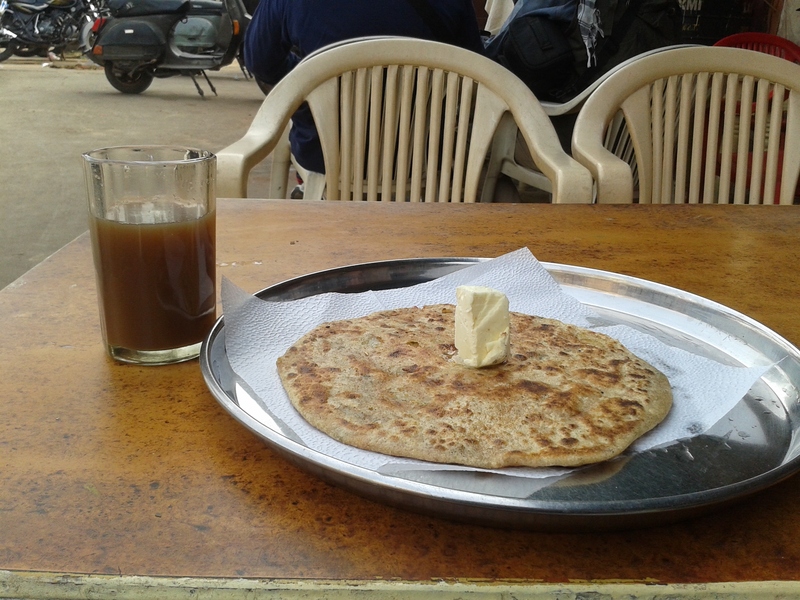 My last meal in Pushkar was at the sunset cafe near Pushkar lake where we devoured chocolate pancakes with great ecstasy. Yeah man I really appreciate my food! Since Pushkar is a holy land, the food fare is all vegetarian and I did crave the laal maas, jungli maas variants of the non veg delicacies of the rajasthani cuisine. Roopangi Devi, my kind hostess for a night in Ajmer had her trusted “bawarchi” – Mr. Samundar Singh rustle up a white meat gravy which had me swooning enough to ponder and plan his kidnap – not kidding the man is a whiz with food! My tastebuds have been despondent since our return! Sigh!! I yearn to return to Pushkar; more for the food than the camels! Its truly a foodie paradise and this is when I havent even scratched the surface of it. Many more quaint cafes, roof tops, down narrow lanes; await my discovery! Next time for sure! Oh yes Keerthi- that was my first impression of Pushkar too; but seeing the various eateries in town, I was stumped too! Awesome Awesome food to be had in Pushkar if you are a thorough bred foodie!!! Aye, this post is so full of FOOD!!! It’s 4:50 pm. my hunger time, and I was just wondering what to prepare for myself, when I read all sorts of yummy stuff in this post! I so wish I could have at least a little something from here! Ha ha Shilpa- glad to tease your hunger pangs – Pushkar was a revelation for me in terms of the food served there! The cosmopolitan cuisines that I got to expereince there was a huge surprise for me – its just amazing to see how confident and savvy these “chefs” are in dishing out this “fancy” fare with such relish and dexterity!